The 59th session of the United Nations Commission on the Status of Women provided a valuable forum for John Jay faculty and students. Associate Professor Jodie Roure of the Department of Latin American and Latina/o Studies, along with students from John Jay College’s Adelante! program, attended a session event at U.N. headquarters on March 11, to hear and participate in deliberations on the Beijing Declaration and Platform for Action, including current challenges that affect its implementation and the achievement of gender equality and the empowerment of women. Click here for more photos of Professor Roure and her students at the UN Commission on the Status of Women. Roure participated in a panel discussion and screening for “Justice for My Sister,” a documentary about a Guatemalan woman’s three-year battle to hold her sister's killer accountable. She was joined by the film’s director, Kimberly Bautista, and Lois Herman of the Women’s UN Report Network. Roure has conducted extensive research in the area of human rights, including violence against women in Brazil, Puerto Rico, Dominican Republic, Cuba and the United States. Her forthcoming book is titled, Domestic Violence in Latin America: Implementing International Human Rights Law and Principles. The Adelante! students, meanwhile, met with Rashida Manjoo, the Special Rapporteur for Violence Against Women, and representatives from both the United States and Guatemalan Missions to the United Nations. Adelante! – a partnership between CUNY's CREAR Futuros Program and John Jay’s Office of Student Academic Success Programs – is a comprehensive academic program that supports the success of students interested in Latina/o issues. 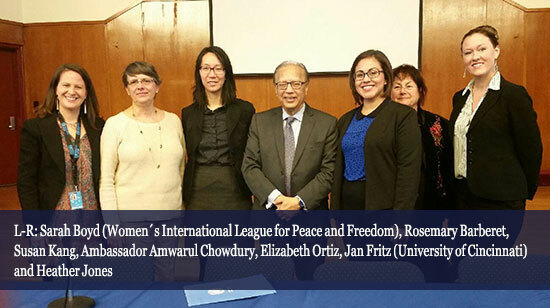 On March 12, Professors Rosemary Barberet and Susan Kang, along with graduate students Heather Jones and Elizabeth Ortiz from the master’s degree program in International Crime and Justice, participated in a side event sponsored by the International Sociological Association in conjunction with the U.N. Commission on the Status of Women.